Experience the unique and varied cultures and tribes of the Omo Valley. Touch down in vibrant Addis Ababa and spot crocodiles on Lake Chamo. Be amazed by the vast Great Rift Valley and discover the traditions of the local indigenous tribes in Jinka, Arba Minch, Turmi and Konso as you take the captivating Southern Cultural Route. Finally, relax in the natural beauty of Awassa. International flights: UK - Addis Ababa - UK. Transfers in a 4x4 vehicle. Boat cruise on Lake Chamo. 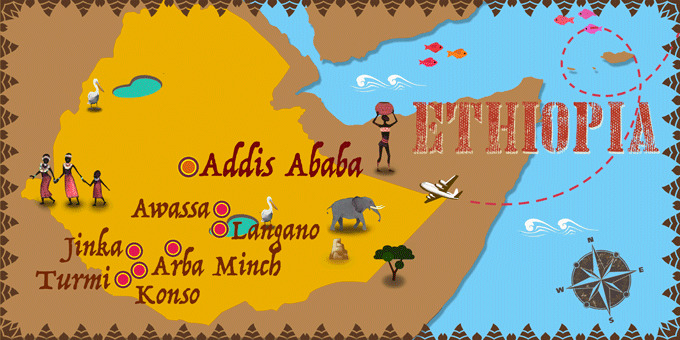 Arrive at your UK departure airport ready for a flight to Addis Ababa. Arrive in Addis Ababa. Meaning "New Flower" it is the largest city in Ethiopia. At almost 2,500 meters of altitude, it combines new high buildings with traditional houses. Transfer to the hotel, check-in and overnight stay in Addis Ababa. Breakfast at the hotel. Set off in your 4x4 vehicle to begin your journey southwards along a paved road with little traffic that will take us to the Tiya archaeological site, home to the tombs of ancient Oromo warriors. Arrive at Lake Langano and enjoy some free time in this magnificent savanna environment on the banks of the lake. Overnight stay in Lake Langano. Breakfast at the hotel. Transfer to Arba Minch, in the beautiful Omo Valley cultural zone, and on the way, visit Alaba Village, a traditional village known for its colourful murals. Pass by the wonderful Rift Valley and marvel at the vistas before you arrive in Arba Minch, set in lush mountainous surroundings. Enjoy some free time to explore the beautiful environment. Transfer to the hotel and overnight stay in Arba Minch. Breakfast at the hotel. In the morning, head to Nechisar National Park and board a boat to navigate mighty Lake Chamo, home to crocodiles, hippos and wild birds. Continue southwards into the savannah, home of the tribal clans of the Omo Valley. Witness the Tsemay and Benna tribes herding cattle in search of water and stop at two iconic cultural events, the first is the Alduba cattle market and the second is the Dimeka tribal market. Continue towards Turmi and visit a traditional Hamar village to get to know about the local customs and traditions. The Hamar people are famed for their Bull-Jumping ceremonies. Transfer to the hotel and overnight stay in Turmi. Breakfast at the hotel. In the morning, cross the eternal savannah, sprinkled with acacia trees, to reach the bank of the great Omo River. Cross the river on barges made from tree trunks to reach the village of Dassenech, where a horse-riding ethnic group live. Enjoy some time to explore the village and the riverbank and admire the beauty of the surroundings. Next, visit the tribal community of Karo, who are famed for their body decorations. Finally, return to Turmi and overnight stay. Breakfast at the hotel. Continue your journey through the cultural Omo Valley, and head to Jinka, located in the hills north of the Tama Plains and famed for its indigenous communities. Stop at the Benna Tribal Market and admire the unique mix of cultures. Visit a local village for a more intimate insight into the lives of the locals before visiting the Ethnographic Museum, a research centre about the tribes of the Omo Valley. Transfer to the hotel and overnight stay in Jinka. Breakfast at the hotel. Today, head to the Mago National Park, to meet the Mursi people, the warrior tribe of the Omo Valley. The Mursi are well known for the large clay discs their women wear in their lower lip. Learn about the cultural and social life of the village and meet the locals. Afterwards, leave the savannah behind in favour of the fertile mountains of Karat-Konso. Visit a local Konso village, declared a UNESCO World Heritage Site. Transfer to the hotel and overnight stay in Konso. Breakfast at the hotel. Head back towards the centre of the country, passing along the route of the Great Rift Valley. Arrive at picturesque Lake Awassa, where you can spend the afternoon at your leisure, relaxing and enjoying a sundowner drink whilst watching the glorious nature in front of you. Transfer to the hotel and overnight stay in Awassa. Breakfast at the hotel. After enjoying a visit to Awassa Fish Market, head back to the capital of Addis Ababa. Visit the National Museum and enjoy some free time before transferring to the airport for a flight back to the UK. Night on board.